The maintenance to healthy glowing skin. Here at The Retreat Clinic, you can be rest assured that our medical grade facials are results-oriented and designed to fit your individual needs. Our therapists are professionally trained and we use the best quality ingredients for all our serums and masks, and the best in technology to ensure that your skin gets a first class treatment. Get your glow back with our signature facial! This Vitamin-C enriched peel facial is designed to rebalance tired, stressed and dull-looking skin to give you a lightening, tightening and brightening results. Comfortably reverse the signs of waging and achieve a more youthful appearance without downtime. Our Sublime treatment effectively stimulates collagen production and improves your overall skin quality in areas that are most telling when it comes to age, such as the eyes, brow lines, cheeks and around the neck. An express beauty treat that actually works and leaves you glowing. So good that it is the best lunchtime beauty fix that ensures you looking like a million bucks even back at the desk! We all know that stress and fatigue can cause dry and problem skin. Be pampered and soothe yourself with our most relaxing facial, which includes a therapeutic massage with a unique essential oil blend. 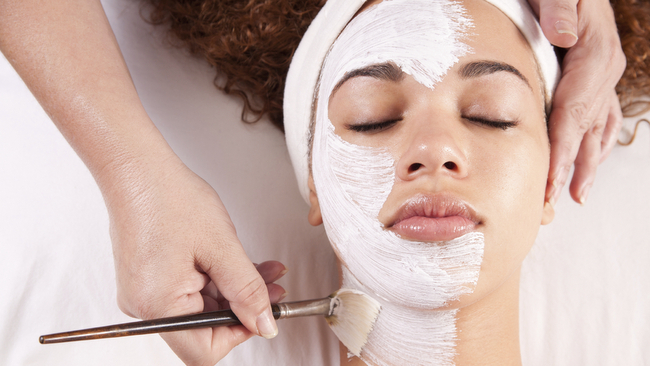 Once you experience our signature facial, you’ll be coming back for more! A deep exfoliating and cleansing facial to refine skin, unclog pores and brighten complexion. You will leave feeling refreshed! Try our laser facial, a combination of our Deep-Exfoliating Facial with a mild C-Peel Laser treatment to laser-away the years. Besides reducing wrinkles and fine lines, the laser treatment will target skin imperfections at the core. This intensive treatment exfoliates all dead skin cells from your face leaving it soft and supple. The Hydrabooster treatment deeply hydrates the skin while plumping and firming the skin. A truly amazing facial. The Retreat Essentials – The only skin care you will ever need. Really.